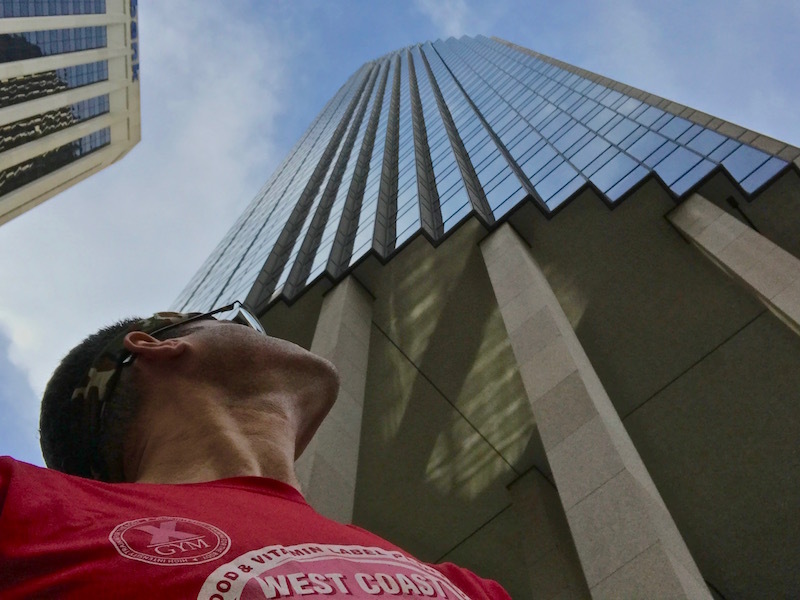 A Totally New Stair Race Experience (2017 San Francisco Fight For Air Climb Race Recap) | Keep It Up, David! On a cheerier note, I have a small personal connection to this skyscraper: my sister-in-law Alexis used to work here. She also used to work at 555 California, where my other two San Francisco races were held (read my 2015 and 2016 recaps! ), so clearly the American Lung Association consults her résumé before planning any of their events! As a building goes, 101 California isn’t nearly as imposing as many of the others I’ve raced in. For one thing, it’s surrounded by buildings roughly the same height, so it doesn’t stand out in the skyline. Couple that with the fact that it’s as reflective as a mirror, which makes it disappear into the city while also highlighting the neighboring towers. I know better than to underestimate a building. 48 stories is still 48 stories, and with 45 stair races under my belt, I know definitively that stair racing is HARD. GRUELING. CHALLENGING. And if you don’t acknowledge and respect that challenge, a building will chew you up and spit you out. There was ample time to warm up and stretch. I lined up for the first wave, which was elite racers and firefighters. There was a bunch of firefighters who were climbing in full gear (50-60 extra pounds of non-breathable, thick clothing and equipment! ), and a group of Menlo Park firefighters who were in t-shirts and shorts. I got into line before the geared-up firefighters, but behind the Menlo Park guys. My buddy Leland was trying to take bets among our group of friends for how many of the Menlo Park guys I’d pass in the stairwell, but I was certain I wouldn’t pass any. I wasn’t being disparaging towards myself; rather, I was accepting the fact that firefighters are strong and in shape, because their job demands them to be, and that they’d hold their own in an event like this. We entered the building one at a time, every 20 seconds or so, and I started on my way up. By the eighth or ninth floor, I had caught up to my friend Mike, who had entered just before me. We were pretty evenly matched, and I stayed on his heels for dozens of floors, half a flight behind him, pushing myself to keep up. Having someone else to focus on and chase does wonders for my mental game. Usually it doesn’t work out so perfectly, that I’m able to climb at the exact same pace as someone else, so I appreciated that I could focus on Mike, and work on making little adjustments to maintain my position behind him. It’s a nice change from overthinking my own performance, which often leads to negative thoughts that are consuming and hard to squash. Keeping up with Mike became more and more of a challenge as we got higher in the building, and shortly after the 30th floor, I started seeing Mike only fleetingly as I turned a corner, and soon after that, not at all. I was in really good spirits, but my body was tired and achy, and Mike was able to pull away as I started to slow down a little bit. 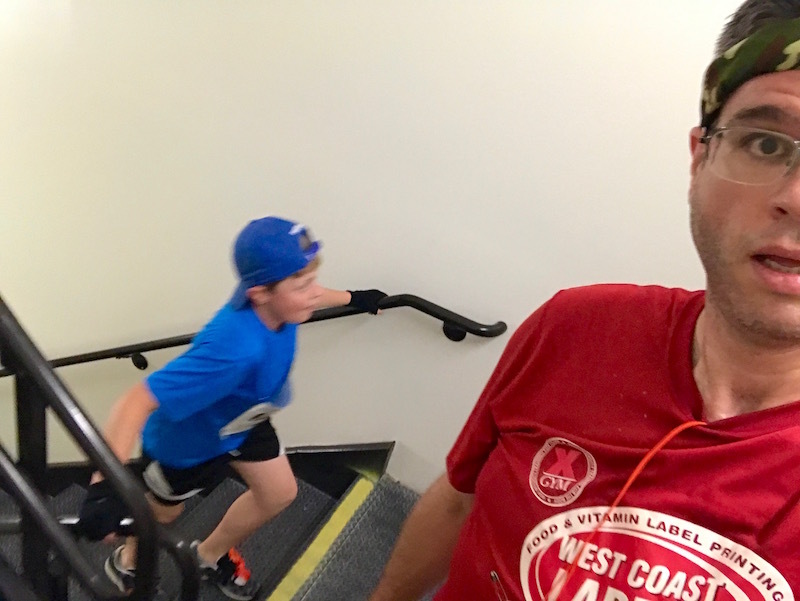 I was still maintaining a good speed, though, and after cruising past a water station (I never stop for water during a race – don’t want to waste the seconds), I was suddenly joined in the stairwell… by a Menlo Park firefighter! He must have stepped into the hall for a water break, because I know for sure I didn’t pass him in the stairwell. And in that split second I went from being the hunter to being the hunted, with a guy hot on my heels, six steps below me, with less than 15 floors before the finish line. I was determined to stay ahead of him, so I ignored the fatigue and the screams from my muscles, and kept climbing at full speed. I glanced back during every turn on the landing, and he wasn’t getting any closer, and that was exactly the boost I needed. And then, as quickly as he had appeared, he disappeared. I think he took another break at another water station, but I’m not sure. All I knew was that the stairwell was suddenly much quieter – just me and the final 5 or 6 stories ahead and above me. 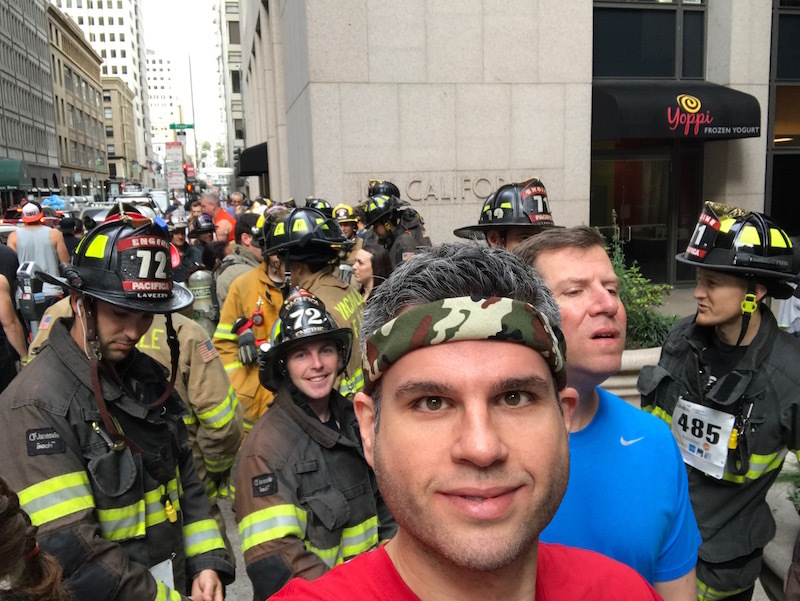 I usually try to give myself a little goose and sprint the final five stories in a race, but thanks to the firefighter, I was already in sprint mode, so my goal became to not let up. 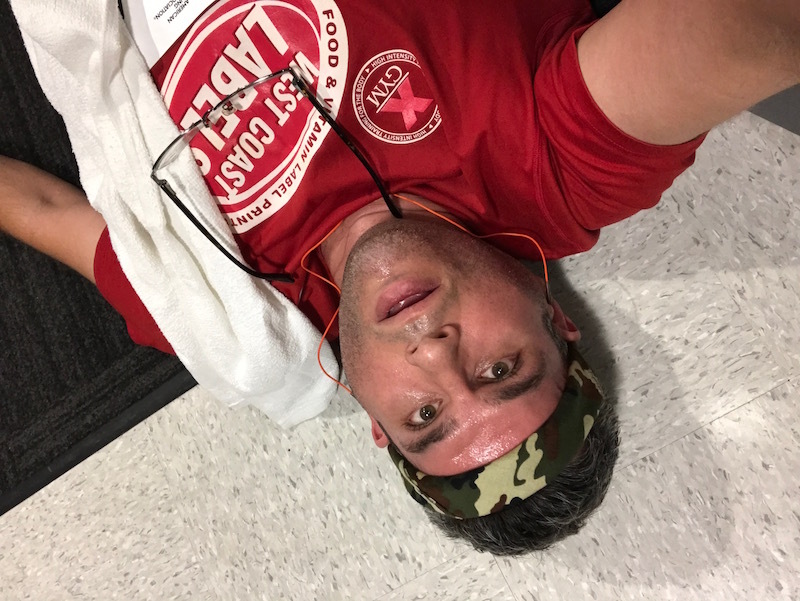 The numbers flew by quickly: 44th floor, 45th, 46th… I thought the race was ending on the 48th floor, but to my surprise it ended at 47, and I crossed the mat, stumbled down the hall, and within seconds was sprawled out on the floor. It was here that I realized I failed to properly start my watch at the beginning of the race, so I had no idea how I did, and would have to wait until they started posting official times. I felt great though… apart from being utterly depleted and barely able to move. I knew I had performed to the best of my ability in that stairwell, and that I couldn’t have done that climb better. Regardless of my time, it was a successful climb. 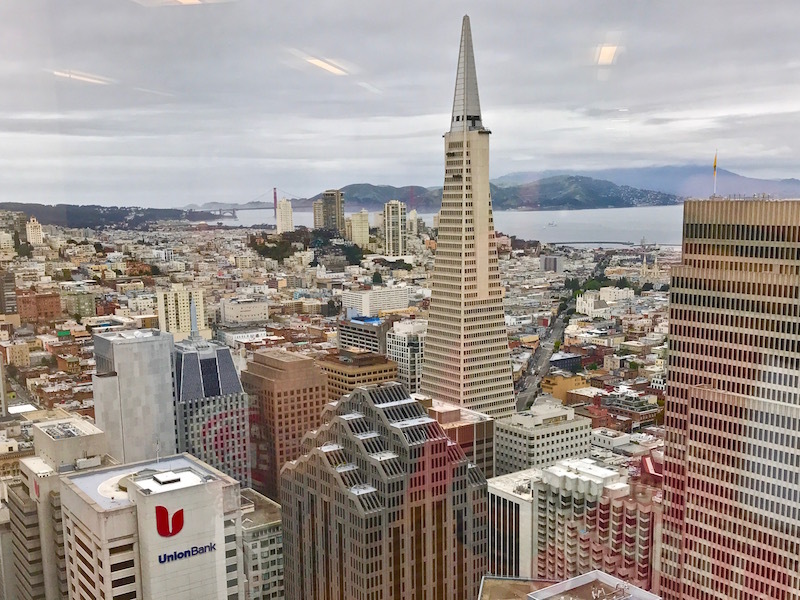 There was a small room on the 47th floor with gorgeous views of the city, with the Golden Gate Bridge in the distance. 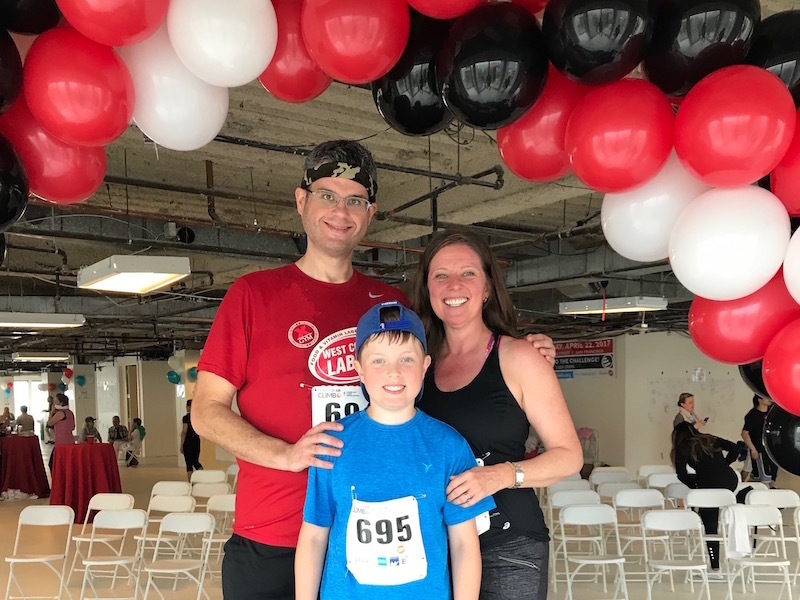 There was also a post-race party on the 40th floor, but I skipped that for now, because I had other plans… to climb again, with Alexis and my nephew Eddie! I headed back down to the plaza, and we got back in line for the stairwell. Eddie’s 10, and this is his second year climbing. And this was Alexis’ first stair race! 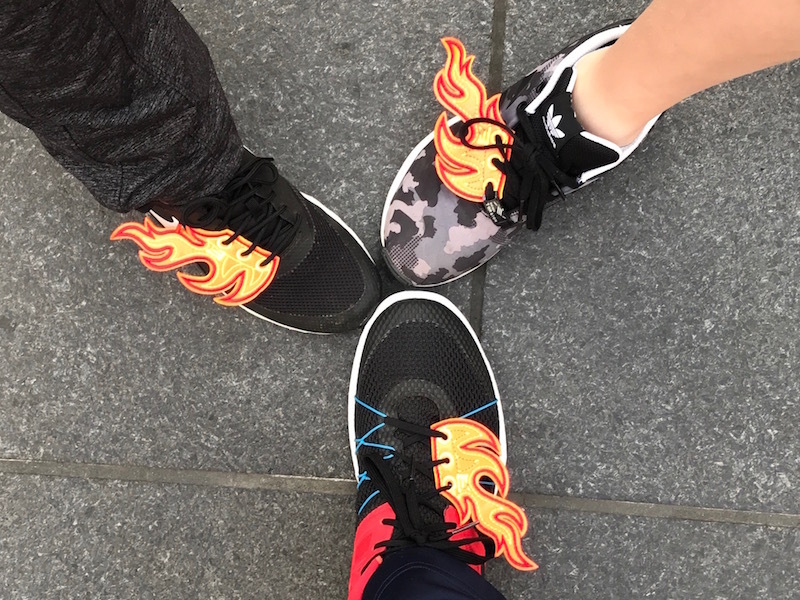 My in-law Katharine had gotten us all matching pairs of Shwings – little flames that we could thread through our shoe laces. What a fun present! Eddie did a great job. He climbed more consistently than last year, used the handrails, and took fewer breaks. It was really neat to see how he had improved. We all headed down to the 40th floor, where there was food, drinks, lots of places to relax, and 360-degree views of the city. 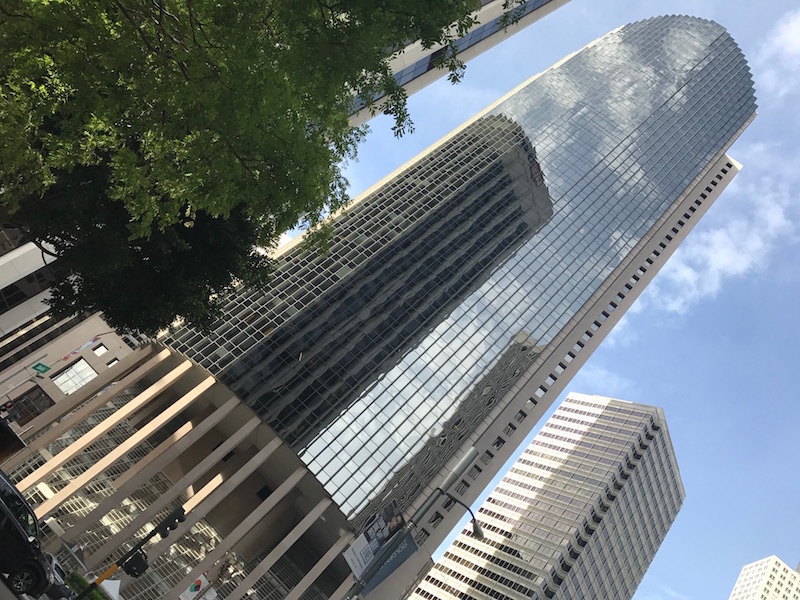 The 40th floor is unleased, empty tenant space, and we had access to all of it, including the big floor-to-ceiling windows all the way around. Eventually all the times got posted. Eddie finished 47 stories in 14:26, and Alexis finished in 12:56. Awesome! As for me, I was expecting, based on my times in other buildings, to finish between 10 and 11 minutes. 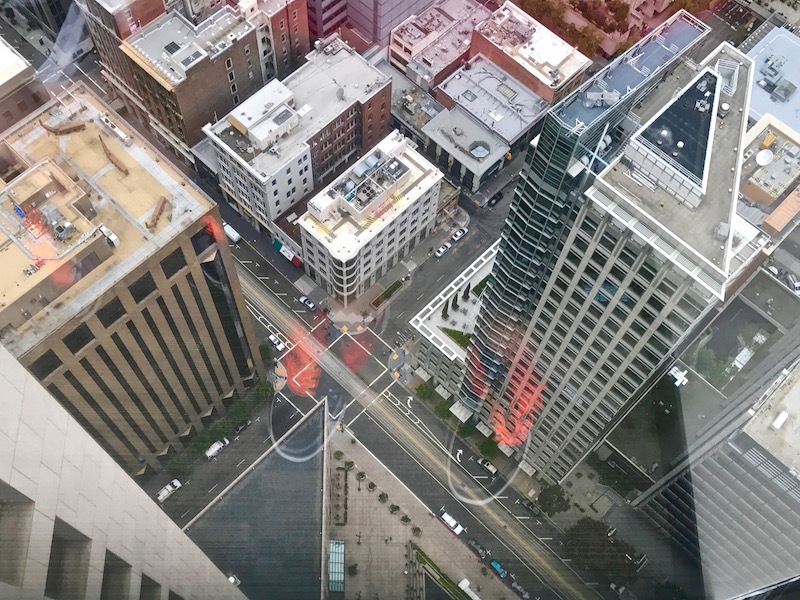 I made it to the 47th floor in 8 minutes, 51 seconds. Holy shitballs! Incredible. I was 79th out of 714 participants – almost top 10%! I also finished 20th in the Men 30-39 division, and 66th among all men. And my friend Mike, whom I tailed for more than half of the climb? He finished in 8:51 as well – we tied! I’m truly floored by my time, but a few days later, as I made the long and dreadfully boring drive back home to Los Angeles, another realization crossed my mind. This was the first race where everything really clicked for me in a way that seemed familiar and, well, normal. I was nervous beforehand, as I always am, but I shoved that aside as soon as I got in the stairwell, and I gave it my all. I didn’t have to think about it, didn’t have to play lots of mental games along the way, didn’t have to remind myself of strategy, technique, or form. I just showed up and did it. It’s a minor, subtle shift, but one that indicates a comfort level with this difficult, brutal sport that I’ve never noticed before. This is my life: traveling to different cities, showing up at various tall buildings, and busting my hump climbing hundreds or thousands of steps until I’m at the top, feeling mighty and proud while wheezing and trembling from the exertion. That’s now normal for me? YES. That’s normal for me. There are many parts and pieces that make up a great race performance, and I know I’ve been able to activate some, or even many of them, during my past races. But even when I set new personal records or blew away my own expectations, I’ve always had thoughts that attribute some of that success to happy accidents, flukes, or some anomaly that was out of my control, that I might not be able to replicate in the future. This time, though, there was none of that. My time in the 101 California stairwell was a complete and direct reflection of my ability, drive, and determination, as well as my commitment to this sport, and my preparedness for this race. I came to San Francisco ready. And I delivered. What an empowering feeling that is! 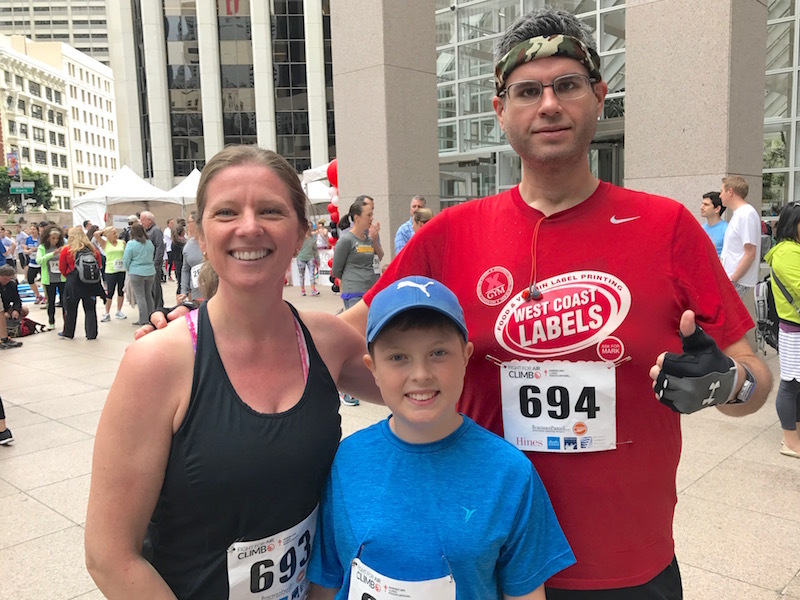 A huge ‘thank you’ to Tim, Heather and John, Suzanne, Dana, Sam, and Janet – all of whom made tremendous donations to the American Lung Association so that I could participate in this race. And my parents, Katharine, Karen, and Sylvia all made donations on behalf of Alexis, Eddie, or our team as a whole, so they get my undying gratitude too. Plus, Steven and Alexis and I donated as well, so we also rock! A huge thank you to Bowflex, my sponsor for this race. Their products help me train, and they’ve proven to be invaluable, and it means so much to have this incredible company in my corner. Lastly, a shout-out to the great team at the bay area chapter of the American Lung Association. They ran a fantastic and smooth event. Well done! This entry was posted on Wednesday, April 26th, 2017 at 1:34 am and is filed under Uncategorized. You can follow any responses to this entry through the RSS 2.0 feed. You can leave a response, or trackback from your own site. Kudos to you, David, for never making a race recap dull. Just when I thought you have said all you can about racing in stairwells, (after all, not a great spectator sport), you make this particular race exciting, so that the reader also can’t wait to read your time. Way to go! Thanks Mom! Appreciate the kind words. After doing 46 stair race recaps, I’ve learned that if I’m honest about my experience, I can (hopefully) put together a compelling read. These races still excite me, and I’m lucky to be able to translate that into a blog post! Another impressive feat with your feet, David! Great job!!! I’m curious though, did you ever discover the mystery of it being advertised as 48 but ending on #47? Thank you George! I never investigated that mystery. Perhaps they started promoting the building before they figured out what floors they had access to for the finish lines? What an awesome comment. Thank you, Karen – hope you’re doing well!